On this third day of Navaratri, I pay homage to Goddess Lalita, Tripura Sundari, a form of Goddess Shakti. What better way than to sing her praise? For today’s prayer, I have chosen one of Shyama Shastri’s (1762-1827) songs from Navaratnamalika, his nine gems in praise of Goddess Meenakshi in her many forms. This song is most appropriate not only because it sings Her praise but even the name of the Raga is Her name. Lalita – what a lovely name! As an adjective, it can mean any or all of innocent, charming, lovely, gentle, pleasing, desired, elegant etc. A Goddess who is all that and more, who can resist Her? The Raga Lalita is equally pleasing, as feminine as the Goddess. To present this song, here is a clip by Nithyasree Mahadevan. I must also urge you to listen to a beautiful rendition by T.N.Seshagopalan which you can listen here. This is a Telugu song but as I don’t know the language, I give below the song in Devanagari script. For transliteration and translation click here. 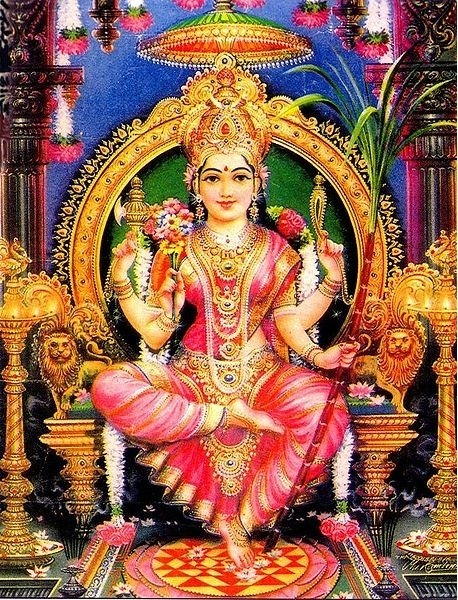 Lalita is a janya raga, derived from Mayamalavagowla (see below), 15th on the Melakarta scale. This is not related to the Hindustani Lalit. Hiranmayim by Muthuswami Dikshithar is another composition in Lalitawhich I enjoy very much. Every time I listen to this song i become totally ecstatic. Pl listen to the rendition by that one and only Seshu. It is a strong favourite of mine and features very regularly on my playlist. And of course I have heard TNS’s rendition, in fact I have given a link already in my post – perhaps you did not notice it. It is a rendition I am very fond of. I also recommend Aruna Sairam from December Season 2001 and from the youngsters, Amritha Murali from Dec Season 2008 both I think available on Music India Online. And yes, I will visit your site.